Baba Stiltz, Eclair Fifi, Redshape, Jerome Hill, Bryan Kasenic and Abby Echiverri will grace the decks of new east London club FOLD over the next six weeks. The Canning Town venue will host the first editions of Visit Party and unFOLD, the seventh anniversary of EarToGround and a joint takeover from NYC institutions The Bunker and Body Hammer. The parties follow on from a 24 launch party in August, with the new 600-capacity club space and studio complex operating a no-photos policy. First on on Friday, October 26th is Baba Stiltz presents Visit Party with Baba Stiltz, Eclair Fifi, Samo DJ and Felix Hall. 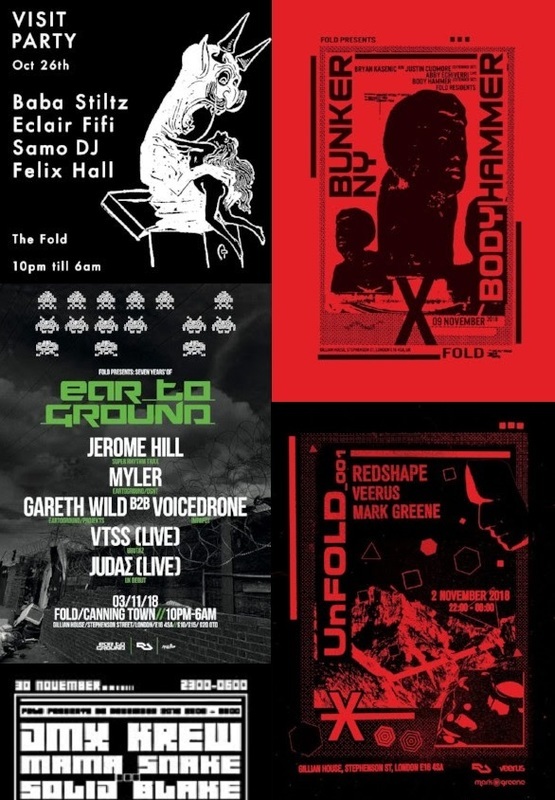 On Friday, November 2nd, UnFOLD_001 will welcome Redshape, Veerus and Mark Greene before Saturday (November 3rd) brings in EarToGround with Jerome Hill, Myler, Gareth Wild B2B Voicedrone, VTSS (live) and JUDAΣ (live). Friday, November 9th will see The Bunker X Body Hammer co-curate with Bryan Kasenic B2B Justin Cudmore, Abby Echiverri (live), Body Hammer and Voicedrone. At the end of November on Friday, 30th FOLD will present DMX Krew, Mama Snake b2b Solid Blake and Metrist. For further events, tickets and details go here.